I love this sink! My contractor had to modify the cabinets to fit this sink, but other than that the installation was easy. Beautiful sink. Cleans easy with a magic eraser. Haven't had any staining issues yet, but rinse the red wine, tea and diet coke down with plenty of water. The 30 inches VIGO Matte Stone Farmhouse Kitchen Sink is constructed from VIGO's proprietary non-porous solid matte stone that resists stains, while the sink's 10mm radius curved corners are designed for functionality and easy cleaning. Choose your sink style: Install with either the slotted or flat apron on display for your modern kitchen upgrade. Includes a sink drain strainer and embossed VIGO cutting board. Please note: Product dimensions may vary slightly from installation dimensions. Dimensions 30.0 In. X 18.0 In. X 9.63 In. BE CAREFUL! Nice sink but... WRONG DIMENSIONS listed on website under 'details'. Overstock clearly lists these dimensions on their website as "Exterior dimensions: 36 inches x 18 inches x 9 5/8 inches" but the sink is only 30" wide. Under specs it says 30 but if you only look under Details (which is the primary listing) the dimensions are WRONG. Overstock customer service processed my return quickly and I am glad for that but I am surprised to see they have yet to make the corrections on their website, over 1 month after I notified them of the error. STUNNING! Well built, packaged well. High End! I am giddy with excitement over this farmhouse sink. This is a BIG purchase and I searched for days. Cast Iron, vs. clay, vs. porcelain... The VIGO had the best ratings in a reasonable price range. It is solid all the way through, so if does get stained, it can be lightly buffed (they provide a little buffer). Some entry level sinks, have an underlayment, so if there is damage or a cut, it is ruined aesthetically. Overstock had the best price around. Furthermore, this thing is HEAVY! Takes two adults to lift. So, the free shipping was particularly valuable here. Several things that tipped the scales for me for this sink in particular: It has two sides. One is smooth apron and the other has a pretty striped pattern. You install the sink to show which our prefer. Also, this is a 30" sink and I have standard cabinet widths. So, I didn't have to worry about this fitting. The sink is deep enough to accommodate most counter top faucets (holes to be drilled in the countertop). This sink has a 3.5" opening that accommodates a garbage disposal, too! Very happy! Great quality! I am in love with this sink! I am in love with this sink! I have been searching hi and low for over six months for the perfect farmhouse sink. I even drove hours to Ikea &amp; left twice without the farmhouse sink they sell after seeing Vigo's sink. I also bought Vigo bathroom faucets a few months back and the quality is remarkable!! I have read every review on the internet! I even read negative reviews on this particular sink due to staining so I have taken every precaution, including buying the sink guard to protect the bottom. It arrived with no issues and is extremely heavy and well made! I love that I can choose which frontside design I want (still deciding! Lol). It is absolutely beautiful and It is being installed this week. Eeek! My whole house is under renovation so I will try to update once it's installed. Love love love the style. The matte finish may not suit everyone’s style, so be vigilant when picking your finish. But I however loved everything about this sink. 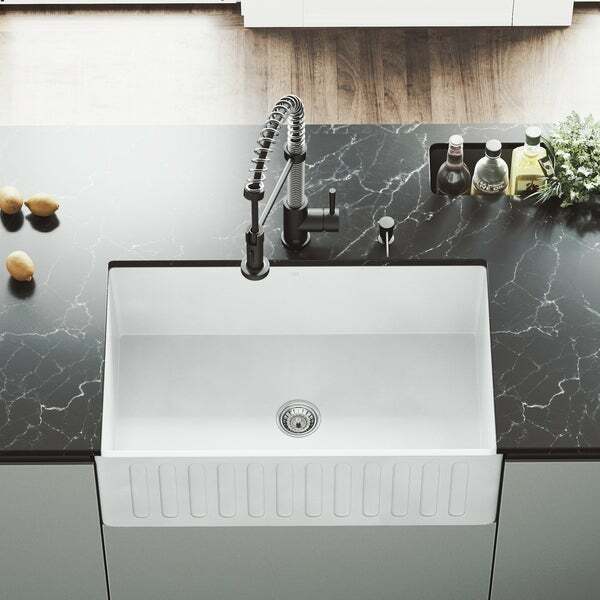 I love the option of the reversible sink with the smooth finish or design. Cannot wait to install this in my kitchen. This is a beautiful sink. The available space to clean large items is a very nice feature. With other reviews saying staining is a problem I was a little reluctant to buy, but I’m glad I did. I haven’t had any problems with stains thus far. Coffee, red wine, blue berries and red sauces have all made their way to the sink surface without issue. We do try to be sure to have the water running as dishes are placed in the sink, and anytime I see what might become a stain I clean that area immediately and if necessary use 1500 grit water sand paper. I have had rust spots appear that I thought might be problematic, but even the rust came out. It might call for a bit more attention than a porcelain or stainless steel sink, but for the price, available space, and style you can’t beat this sink! Just got this installed over the weekend. 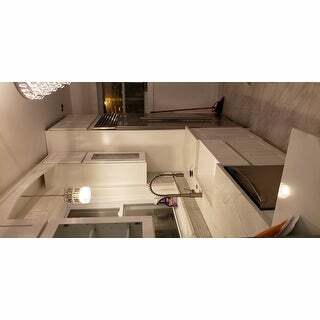 We chose the smooth side and it looks great in the kitchen. Great option to have the slotted side and smooth in the same sink. This user was entered into a sweepstakes after submitting their honest review. I love our new sink! Looks great and easy to clean! Would recommend this sink to anyone looking for a farm sink. My husband swears I have eyes for expensive things so when I found a farmhouse sink for under $600 that was deep and could fit 36” cabinet I had to buy it! I love the fact I have the option for 2 faces and that it is supposed to be stain resistant and has warranty. The look is exactly what I wanted! We just put this in our kitchen remodel and we love it. 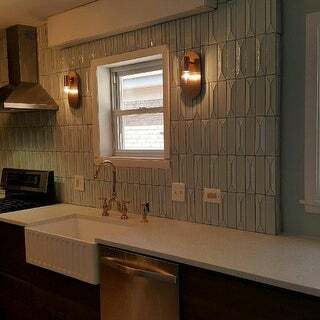 We used the textured side, as the ovals mirror our backsplash tile. It does stain quickly with certain foods, but the stains are easily removed with a little bit of comet. Sink was fine. But not what we wanted. It did not have the finish we were looking for and did not feel very solid. You get what you pay for.. This sink is beautiful. I am doing a remodel and have been looking at this sink everywhere. Overstock was the best price and I have never been disappointed with there quality or service. Bought this for my remodeled kitchen. I have been using for 3 months now with no issues and no stains. I would recommend for the great price. Love the sink - had a custom cabinet made and they set the sink in - Perfection - just what I wanted!!! I am happy with this sink in my kitchen. It is a nice size and can fit bigger platters without a problem. I am very worried about staining inside the sink so I don't leave anything in there too long. So far so good! Perfect for this remodel update. Beautiful sink! I really like this sink. I put the same type of faucet as in the picture. Delivery was fast as well. This sink is awesome. Exactly as shown and described. Looks perfect in our renovated kitchen. This is a quality made sink. Fit and finish are spot-on! Could not be happier. Love, love, LOVE this sink. Looks really great, easy to keep clean. I wasn't sure I would like only a single sink, but I cannot say enough how much I love it! "Has anyone tried to install this themselves? How hard is it?" "What is the minimum cabinet size for this sink?" The cabinet space is a minimum of 30 inches. "Does this apron sink come in grey?" "I need to order another strainer for this particular sink and I've ordered multiple Vigo strainers online but none of them fit. Can anyone help?" "Can someone refer me to a dunk grid that will fit this sink?" "The VIGO Matte Stone Reversible Farmhouse Kitchen Sink says the color is silver. In the photograph it is white. What color is the sink?" "Does the interior have angle so that contents drain out properly? Can you get a grate to fit?" Yes, the interior on this sink does have angles for proper drainage. Unfortunately, there is not a sink grate that fits within this sink. Whether you're building a new kitchen or remodeling an existing one, you're probably in the market for a new kitchen sink. In order to find the sink that meets your needs both functionally and aesthetically, it's important to consider placement, style, and kitchen size. The texture and shine of copper fixtures can add a classic look to your home. These answers to frequently asked questions about copper sinks will show you how to care for copper fixtures. How to Install a Drop-In Kitchen Sink from Overstock.com. Learning how to install a drop-in kitchen sink is a great way to save money. How to Measure for a New Kitchen Sink from Overstock.com. Our guides provide customers with information about how to measure for a new kitchen sink. 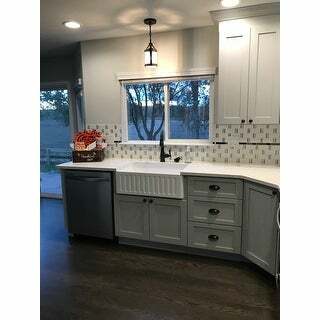 Top 5 Most Popular Styles of Kitchen Sinks from Overstock.com. Our guides provide customers with information about the top five most popular styles of kitchen sinks. Sink Materials Fact Sheet from Overstock.com. Our guides provide customers with information about sink materials. If you practically need a headlamp to find your way around your home, you're in need of some new lighting. The right light bulb can transform a murky coal mine into a space full of radiance and positivity. You can play with the shapes and bases of different bulbs, but ultimately, you need to know the requirements for your room and fixture. Use this guide to compare different types of light bulbs and find one that will cast the perfect homey glow. When you're juggling classes, keeping your college apartment organized can be difficult. But with these tips, you and your roommates can have a tidy space. An outdated bathroom can feel out of place in an otherwise beautiful home, but making upgrades on your own is simple. How to Refinish Kitchen Cabinet Doors from Overstock.com. Our guides provide customers with information about how to refinish kitchen cabinet doors.